Prince's Bay 12.45pm. A short one hour cruise. Tuesday, Thursday, Friday and Sunday. A short cruise to where Bonnie Prince Charlie paused before landing by longboat at Glenfinnan, taking in magnificent views of the railway viaduct, the church and the famous monument at Glenfinnan. "Gaskan" Cruise, 2.5 hours, Dep: 1400. Locheil, on his escape from the battle of Culloden. Experience the full splendour of the Loch, departing from Acharacle with a connection by local service bus back to Acharacle from Glenfinnan. Experience the full splendour of the Loch, departing from Acharacle. Sit back and enjoy the view and commentary as you sail down this magnificent and historic waterway. Passengers with a particular desire to see the rare and beautiful Black-throated Diver and the White-tailed Eagle are advised to take this cruise, there is an increased chance of sighting a Golden Eagle due to the boat covering the whole length of the Loch. On this cruise walkers or cyclists can be dropped off / picked up at the new pontoon at Polloch by prior arrangement at approx. 2.15pm. The forestry road from Polloch Pontoon to Glenfinnan is around 13 miles long. Landings at Dalilea can also be made on request. This is a one way ticket (single) from Acharacle to Glenfinnan. Please check bus times but we aim to be in Glenfinnan in time for the local bus to take passengers back to Acharacle (1hr journey, cost £5 payable to the driver). 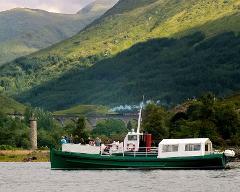 A one hour evening cruise in the Glenfinnan area of the loch in the company of a local bagpiper. A real memory making trip! visitor centre and walking down to the jetty by the Glenfinnan House Hotel. 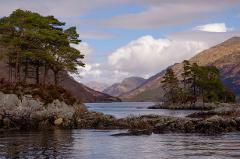 Experience the full splendour of the Loch, departing from both Glenfinnan and Acharacle. Sit back and enjoy the view and commentary as you sail down this magnificent and historical waterway. On this cruise walkers or cyclists can be dropped off / picked up at the new pontoon at Polloch by prior arrangement. The boat arrives at Polloch from Glenfinnan at approx. 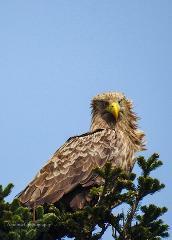 11.00am and from Acharacle on the return leg at approx. 2.15pm. The forestry road from Polloch Pontoon to Glenfinnan is around 13 miles long. Landings at Dalilea can also be made on request. Passengers with a particular desire to see the rare and beautiful Black-throated Diver and the White-tailed Eagle are advised to take this cruise, there is an increased chance of sighting a Golden Eagle due to the boat covering the whole length of the Loch. Experience the full splendour of the loch passing by the ancient burial island Eilean Fhlanain, locally known as the Green Isle. 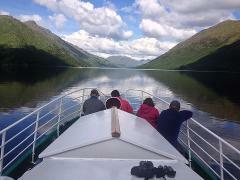 Experience the full splendour of the Loch, departing from both Glenfinnan. Sit back and enjoy the view and commentary as you sail down this magnificent and historic waterway. On this cruise walkers or cyclists can be dropped off / picked up at the new pontoon at Polloch by prior arrangement. The boat arrives at Polloch from Glenfinnan at approx. 11.00am. The forestry road from Polloch Pontoon to Glenfinnan is around 13 miles long. Passengers with a particular desire to see the rare and beautiful Black-throated Diver and the White-tailed Eagle are advised to take this cruise, there is an increased chance of sighting a Golden Eagle due to the boat covering the whole length of the Loch. This is a one way ticket (single) to Acharacle. Glenaladale Cruise, 2 hours, Dept:1040. A cruise halfway down the Loch to this beautiful and majestic glen, homeland of a notable branch of the MacDonalds of Clan Ranald. This cruise departs in time to see the Jacobite Express steam train crossing the viaduct. Glenaladale is only accessible by boat or by a long long walk hence it is an unspoilt and wild glen. In 1745 Bonnie Prince Charlie spent a night here prior to landing at Glenfinnan, where the Standard was raised, starting the ill-fated Jacobite uprising and the quest to reclaim the throne for his family, the Stuarts. A descendant of the MacDonalds of Glenaladale built the monument at Glenfinnan in memory of the clansmen faithful to the Jacobite cause. Superb views of the monument, church and *21-arch railway viaduct. *See the “Jacobite Steam Train” crossing the viaduct on this cruise. This was a film location for Harry Potter.